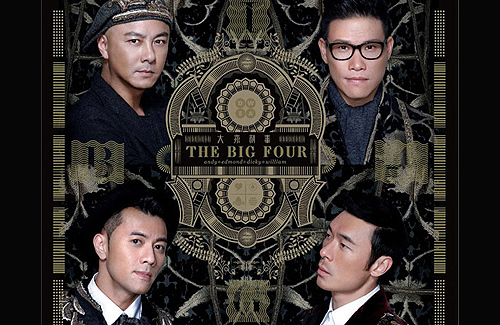 It has been over three years since Dicky Cheung (張衛健), Andy Hui (許志安), William So (蘇永康), and Edmond Leung (梁漢文) have last released an album together under the name Big Four. Their 2010 album The Big Hits Big Four, a compilation of all the hit songs released by the four award-winning singers, was also responsible for supporting the group’s first major world tour concert in March 2010. After three years of pursuing individual careers, Big Four came back together in late 2012 to release their comeback single, “Everyone is Lucky” <大家利事> in November. The group’s comeback EP, self-titled The Big Four, was released on February 8, 2013. Consisting of five brand new tracks, the EP also includes the addition of Dicky Cheung’s first solo Cantonese song in 20 years, “The Vagabond Couple” <流氓伉儷>. “Everyone is Lucky,” which is produced by Big Four’s longtime collaborators Mark Lui (雷頌德) and Wyman Wong (黃偉文), is also a promotional track for the group’s second world tour, The Big Four World Tour < The Big Four大家利事世界巡迴演唱會>, which commenced with six shows at the Hong Kong Coliseum on February 9, 2013, the eve of the Lunar New Year. The Hong Kong leg of the concert ended on February 15, 2013 to a successful box office performance. The Big Four World Tour will stop by London’s The O2, the tour’s only stop in Europe, on March 18, 2013. Andy Hui’s voice is the best! He has the strongest vocals among Big Four; love his new song. Dicky has the most distinct voice though. I wonder how many album they will sell (apart from them buying for their friends and family or their friends buying it). It’s ok to listen to it but would anyone fork out USD11.99 (Yesasia price) for 5 songs?? pretty upset that i cant see their show in uk on march 18th.